Pressure treated lumber is typically the most economical type of decking that we install. This lumber has been immersed in a liquid preservative and placed in a pressure chamber. The chamber forces the chemical into the wood fibers. This pressurized approach makes sure that the chemical makes it to the core of each piece of wood. The most common chemical used to treat decking lumber is alkaline copper quat, or ACQ. 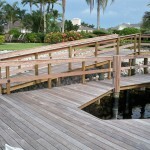 In Southwest Florida, unsealed ACQ decking has a life expectancy of 8-10 years. At this age, the wood will begin to deteriorate by cracking and splintering. ACQ decking that is sealed with wood stain every 2-3 years has a life expectancy of 12-14 years. Due to this life expectancy and repeated maintenance the composite decking options have become more popular and cost effective.